Top 3: Mid-day Concerts at the Bridgewater Hall in December. Originally formed in 1985 right here in Manchester, at the RNCM, the inspiring Apollo Saxophone Quartet’s influence now stretches the globe, having commissioned over 100 innovative works and made numerous recordings. Comprising Rob Buckland, Jim Fieldhouse, Carl Raven and Andy Scott, the group has been praised as having made the largest single contribution to saxophone quartet repertoire in the UK. For this programme, the four musicians present an exciting and varied choice of pieces: Luís Tinoco’s Short Cuts, Simon Parkin’s A G F, Barbara Thompson’s White from Saxophone Quartet No.2, Graham Fitkin’s Stub and Will Gregory’s High Life. 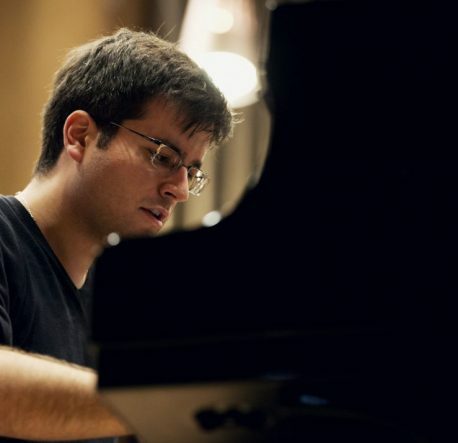 Hailing from Bucharest, British-based pianist Florian Mitrea has enjoyed regular success in international piano competitions, so far this year being a major prizewinner at the International Music Competition Harbin, China, ROSL London, and New York Piano Festival. Flawless in technique, he also demonstrates a deep affinity for piano colour and sonority, something that this choice of pieces should show off to the full: crisp classicism in Haydn’s Sonata in E-flat major Hob. XVI:52, sensitivity in three preludes by Debussy (La Danse de Puck, La cathédrale engloutie and Feux d’artifice) and, we’re told, demonic virtuosity in Liszt’s Mephisto-Waltz No.1. This special Christmas concert is a festive favourite at the Bridgewater Hall, so be sure to book tickets early to avoid disappointment. The Manchester Chamber Choir have a captivating style and range, and, led by dynamic conductor Jonathan Lo, they’re bound to get you in a suitably seasonal spirit. With classic carols including Ding Dong Merrily on High, In the Bleak Midwinter and The Twelve Days of Christmas alongside some lesser-known but no less enjoyable songs and hymns, this should put you in the mood for a tot of mulled wine and a mincepie or two.